1 What’s Aaron Judge’s Net Worth? 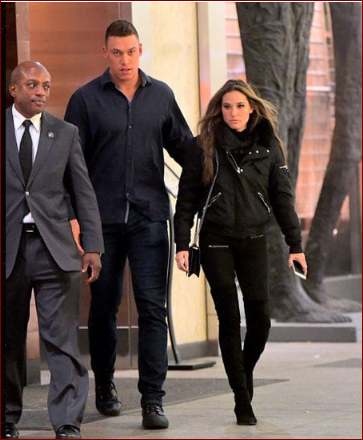 2 Who Is Aaron Judge Dating Recently? Aaron Judge, Yankees outfielder suffered a chip fracture in his right wrist after being hit by a pitch Jake Junis during the first inning of Thursday nights 7-2 win over the Kansas City Royals. In addition to that, He is going to miss three weeks, according to Yankees. Aaron Judge plays for the New York Yankees of Major League Baseball (MLB). The pro-baseball outfielder earns impressive amount through his career. Today, let’s uncover his salary, net worth, and lifestyle in detail. What’s Aaron Judge’s Net Worth? Unlike other players, Aaron Judge is paid well for endorsing brands like Adidas. He receives a salary of 622,300 USD as of 2018. According to Celebrity net worth, Aaron Judge has a net worth of $10 million. In 2013, Judge signed a $1.8 million bonus with the Yankees. By the 2017 season, he has grown into one of the best and most exciting players in the league. Needless to say, Aaron signed a One-year, $544,500 Contract before the 2017 season. Who Is Aaron Judge Dating Recently? At present, Aaron Judge is possibly single after he broke up with a girlfriend, Jen Flaum. Aaron first met Flaum in mid-2017 since then they have been dating on-off for a year. Firstly, Jen Flaum is a graduate of Michigan University with a degree in Psychology and Marketing. Secondly, she is a die-hard fan of Yankees as proved by her Instagram page. Judge and Flaum were spotted at Rafael Nadal’s Match on September 2, 2017. Recently, she is not such a big fan. But it seems like Flaum is quite interested in keeping an eye on the Yankees star. Literally, Jen was caught stalking him just in April, harassing a stranger on Instagram to send her photos of Aaron with the girls he’s been seeing since they split. Prior to Jen Flaum, Judge was previously linked to Sterling Olmstead.